Khenko – the Great Blue Heron – flying above False Creek in George Wainborn Park. Off to Spokane for a few days. See you later. Problem: a couple of badly sited Hydro boxes in front of Elsie Roy School near the Roundhouse. Scot Hein, head of the Urban Design Studio at City Hall, along with his assistant Phil Scott, came up with an elegant solution. How about a screen made up of images drawn by the students themselves, of themselves? Other problem: no money. But they got the buy-in from principal Isabel Grant and, better yet, School Board shop manager Walter Adolph, who fabricated the screen in house. The Concord project is often criticized for having a relentless sterility, albeit a very well designed sterility. Here’s a fine example of how time and personal touches take care of that. What happened to car alarms? I may be totally wrong on this – especially since we moved to a quieter part of the West End – but I don’t think I’m hearing as many car alarms going off. Particularly at night. I asked a few others about this, and they concurred. Maybe it was because car owners realized the alarms were being ignored, or reset their sensitivity, or replaced them with bars on the steering wheel, or I’m going deaf. Whatever. But thank you, thank you. What happened to the buskers? A few years ago, Robson Street was awash in musicians, and not just on weekends. Some were pretty good, others a waste of sidewalk space. Now it’s unusual to head a good sax riff on Granville. Where did they go? First night of the fireworks at English Bay. Just us and a quarter million of our neighbours. I’m not sure why photographers try to capture fireworks, or sunsets. The result is always going to be a little disappointing, since you’re turning something that generates light into something that reflects it. So we get a little arty instead. But here’s something you might not have seen if you don’t stick around after the crowds have dispersed. Down on Beach Avenue by the Aquatic Centre, there’s a convoy of sanitation trucks waiting to move into action, preceded by a phalanx of motorcycle cops, their lights ablaze. As the parade gets underway, there are cheers from the balconies above; people applaud from the curbs. Someone even has a trumpet. This must be a thrill for guys in the Engineering Department. Talk about respect. And for boys, who are genetically programmed to get off on trucks, the engineering parade must be a bigger blast than the fireworks. Doug Taylor, the creator of Khenko (see post below), sent along these pics when the sculpture was placed in George Wainborn Park. It helps to know that Khenko is about five-storeys high. Just over two years ago, when I was first started Price Tags, Khenko was on the cover of No. 28. Khenko is Coast Salish for the Great Blue Heron – in this case, the wired version. Now it’s not just a model. Khenko is flying. The sculpture was raised last Friday. You can see the sail-blades from Granville Island. 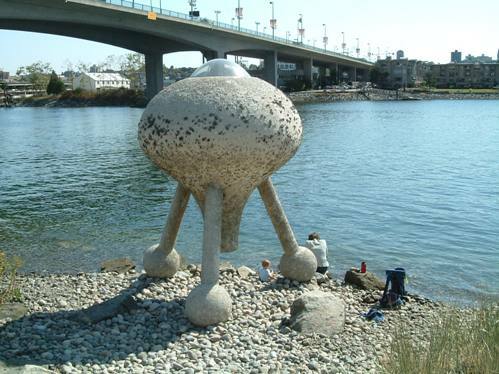 In fact Khenko is visible from many points along the Creek, since it’s placed at the southern-most point of George Wainborn Park, on the north shore of False Creek, just east of the Granville Bridge.